Arrrrrrggggghhh! The "Zombie Battle" SoundSet brings every bit of Zombie grossness you could possibly want right to your gaming table. 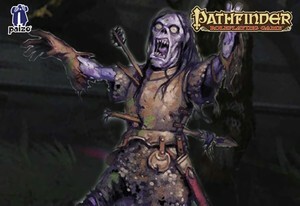 Moaning, shuffling, bites, scratching bones, squelching flesh and vicious inhumanly stupid growls will have your players looking nervously over their shoulders. Might just be a tiny bit useful for your Halloween set up too!